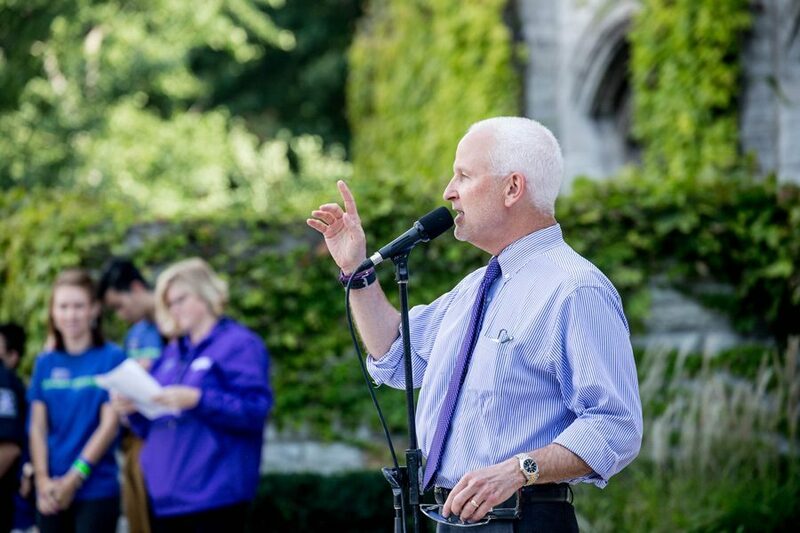 University President Morton Schapiro addresses new students in September. In 2014, Schapiro's annual salary was $2.35 million, according to a report from the Chronicle of Higher Education. University President Morton Schapiro ranked sixth in a national list of highest paid presidents at private and public colleges, according to data released Sunday by the Chronicle of Higher Education. Using private college data from 2014, the Chronicle reported Schapiro’s annual salary to be $2.35 million, with a base pay of nearly $1 million and bonuses worth a total of $100,000. The data includes presidents’ base pay, deferred compensation and bonuses. University spokesman Al Cubbage said Schapiro’s 2014 salary is accurate but declined to comment further. On the national list, Schapiro ranked the highest among university presidents in Illinois. University of Chicago president Robert Zimmer placed eighth with a salary of just over $2 million. Schapiro and Zimmer were among eight presidents who earned more than $2 million and 39 who earned more than $1 million.